After a long cold winter, many homeowners make the decision to move their family to a warmer climate in the Southwest, such as Las Vegas. Not only is it exciting to have a new beginning in a different part of the country, but a new beginning to create the living environment you’ve always dreamed of. Much of the unique residential architecture in Las Vegas is complemented by a popular Southwestern charm. 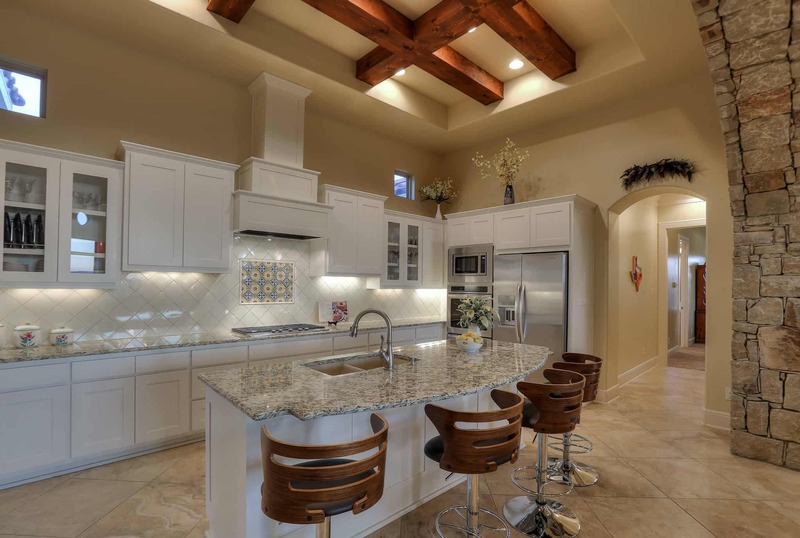 These extraordinary home designs are found in Adobe, Southwest, Tuscan, Mediterranean and Contemporary style homes–each focusing on uniting the indoors with the outdoors–creating an open, picturesque atmosphere of the Southwest throughout the entire home. Home renovation companies in Las Vegas are also finding more homeowners already living in Las Vegas wanting to transform their traditionally designed homes into a more Southwest living style–creating a seamless indoor-outdoor flow for a soothing and serene atmosphere. Living in the Southwest allows homeowners the opportunity to have these luxury designs, where enjoying the 3-plus seasons of outdoor living is a daily way of life. Southwestern design is about bringing the natural beauty of the desert into the home, and one way to achieve this without necessarily falling into the typical Southwest stereotype designs, is to blend earthy and natural elements with modern and unexpected accents. Here are some Las Vegas home remodeling ideas guaranteed to bring the charm and elegance of the Southwest into your home! In the past, exposed beams were thought to be only found in barns or perhaps French kitchens. You rarely saw them in homes, unless it was perhaps a log cabin or something like Ben Cartwright’s ponderosa ranch on Bonanza. However, today this trend is more popular than ever–especially in Southwest home design. Exposed beams add the perfect touch of rustic charm to any home in any room. This feature on vaulted ceilings or standard ceilings calls attention to any space and reveals the raw structure of the home in a classy way. The rugged timelessness of exposed beams truly elevates the atmosphere of the home, allowing for a natural contrast to your indoor living space. Much like the concept of exposed beams inside the home, an open beam wooden structure for patios (referred to as a “pergola”) also serves the purpose of bringing more Southwest beauty to your outdoor living space. Pergolas are not designed to completely block out the sun, but offer just enough shade from the direct sunlight while filtering sun rays to create interesting shadow play all around. Pergolas create a definitive space for entertaining and relaxing and enhance your outdoor living space (and certainly add value to your home). You can get creative with a pergola–such as hanging lanterns and stringing lights up into the overhead beams for a dazzling rustic evening ambiance. Accenting with side curtains not only allows for extra side shade and privacy, but adds elegance to your rustic pergola. Wood beams that poke out of your pergola are known as “vigas” and most definitely enhance the rugged nature of this structure (as well as on the home for that matter). Hanging plants around your pergola add color contrast, and comfy furniture around a fire pit makes for a perfect evening gathering spot. 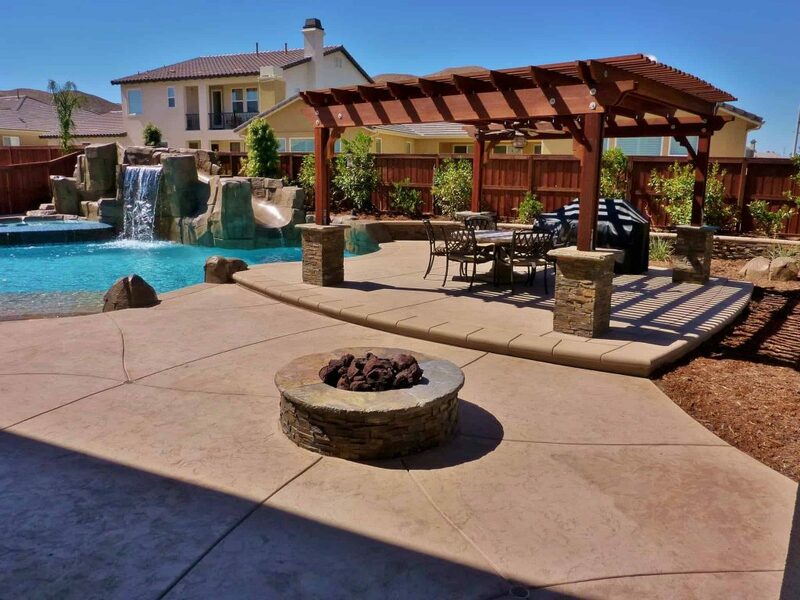 Perhaps you might have two pergolas, one larger structure for your gathering area, and another smaller structure for a jacuzzi or outdoor kitchen. You can inquire with your Las Vegas Contractor about incorporating a retractable canvas roof (that can be pulled back or forward in individual sections) for just the right amount of shade. Fire elements that accent your poolscape offer a dramatic, romantic ambiance for relaxing and entertaining poolside. General contractors in LV will confirm that this combination has become ever more popular in the Southwest, where homeowners are enjoying the outdoors for the majority of the year. Imagine the soothing effect of floating in your pool under the stars while gazing into dancing flames inside a 12’ long fire trough–perhaps featuring brilliant blue stones for a splash of color. There are different ways to incorporate your fire structure depending on your preferences and how you intend to use it. Whether you want your fire pit in the center of the pool or fire trough running along the side, the combo of water and fire creates a breathtaking surrounding of drama and beauty. Incorporating a waterfall on the pool side of your fire structure is another exciting feature! The combination of water and fire elements blends tranquility of a tropical paradise with the rustic nature of the Southwest, and offer an enchanting experience for those who want a unique outdoor atmosphere. Many homes in the Southwest have patios, decks, or porches, but having an enclosed courtyard offers a unique sense of comfort, style, and tranquility. Unlike the patio or poolsides, the enclosed courtyard is not the main event, but the more private retreat–something that renews the soul. We find peace and relaxation–perhaps going out to read a book or have morning coffee. It can be a place for creating music or having a glass of wine with a friend. If you don’t have a pool, as your Las Vegas Contractor to incorporate a fountain into your courtyard will not only add beauty, but the serenity of trickling water will soothe and cool you while you bathe in the sun. Courtyards in front of the home are a beautiful way to display your entrance. Compliment with an iron gate or an old distressed wooden door that leads the way for all to admire your enchanting desert oasis! A fireplace is often the focal point of the room, and when it comes to identifying with the Southwest, there are plenty of amazing designs to bring a rustic elegance into your home. Adobe style fireplaces first come to mind, and are often designed with layers of shelves and interesting decorative niches to display home decor. You can ask your General Contractor in Las Vegas to incorporate a beautiful tile design above or around the firebox opening, as well as adding a bench above the hearth for a warm and cozy spot. 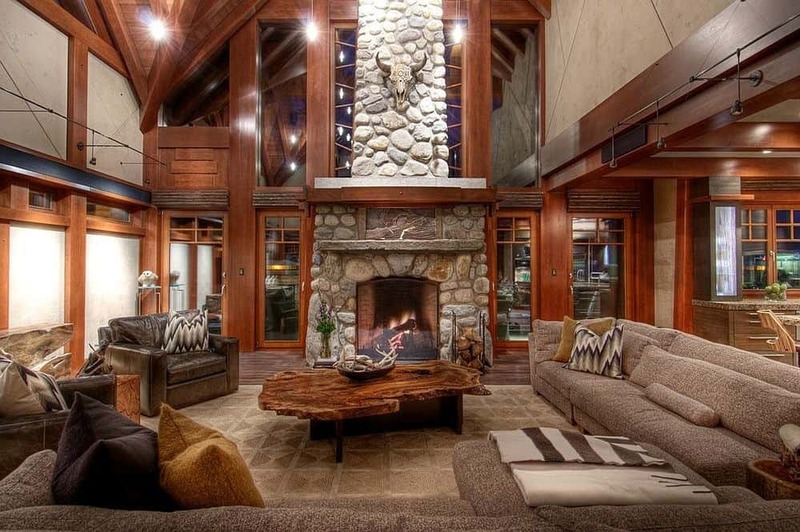 A fireplace made with fieldstone is truly captivating, as it takes center stage no matter what room it occupies. Fieldstone extending up a vaulted ceiling makes for a dramatic presentation. A rustic stone fireplace adds contrast to any room–while creating a cozy, welcoming feeling for everyone who enters. You will find “in with the old” is the trend in the Southwest today, and going with engineered stone is another great choice for a fireplace, as it displays an old tumbled look. The option of leaving out the motor adds to the rugged appearance. There are many amazing mantel designs you can create–such as an old hand-hewn timber that adds a rustic natural element to your fireplace. Studies have shown that natural light is at the top of the list of features homeowners look for when purchasing a home and certainly up on the list when it comes to home renovation. The true beauty and comfort of natural light entering the home brightens up not only the home itself, but lifts spirits for all those inside. Natural light is of course plentiful In the Southwest, so harnessing/capturing this natural gift by incorporating skylights can be a dramatic focal point in your home. There are a wide variety of skylight designs and plenty of suggestions of where to place them in the home. For more on Skylights, visit our “Skylight Highlight” blog. Las Vegas Contractors will confirm that one of the most requested home renovations in Las Vegas–especially with homes that offer views of the valley—is installing scenic doors. Here in the Southwest you are granted spectacular, breathless views of the valley, and having these amazing doors installed in your home allows you to be in perfect harmony with your desert surroundings! These stunning doors blur the lines between indoor and outdoor spaces, celebrating the Southwest in every way possible. For more on scenic doors, visit our “Room with a View” blog. When attempting to achieve the Southwestern style, focus on pulling from earth-tone colors and materials that make up the palette of our desert surroundings. Azure blues, sunset reds, forest greens, weathered browns, rich salmons, and slate grays awaken peace and serenity found in our desert landscape. Flooring for a Southwest style should tie together with these earthy tones, and your Las Vegas Contractor will most likely suggest either hardwood flooring, ceramic tile, or natural stone to achieve this effect. Hardwood flooring is a great choice in the Southwest as it offers rich colors that compliment the decor lifestyle of the region. For more rugged/rustic look, distressed hardwood is the answer–and if you like the look but prefer tile, no worries! There are many incredibly impressive tile designs that mimic hardwood and bring out that classic Southwestern rugged look. Terracotta tile emulates the minerals found throughout the Southwestern desert and is a perfect choice for achieving the desired look, as is natural stone that reflects the pure beauty of the American Southwest. Luxury Vinyl Tile products can also offer the look of natural stone should this be an alternate choice of material. If you live in the Southwest and enjoy entertaining, you will soon be dreaming of having an outdoor kitchen. An outdoor kitchen is the first class way to go when it comes to gathering your guests outdoors. There are many reasons an outdoor kitchen is beneficial and why kitchen remodeling should extend to the outdoors. It’s a great way to entertain, especially if you have a larger group. When it gets crowded in the indoor kitchen (because let’s face it, everyone ends up hanging out with the cook! ), it can get a bit stressful. With an outdoor kitchen and all the extra added space, this is never a problem. When you cook indoors–especially in the summer–the temperature in the house rises several degrees and thus compelling you to crank the air conditioning. There is never a worry about your energy bill rising when cooking outdoors. Unwanted smells that would linger in the house from cooking indoors–such as fish–are no longer an issue. Cooking outdoors improves flavor and fat drips off meat when it is grilled, which is much healthier as well. Incorporating an outdoor kitchen into your home remodeling design is an investment that increases the value of your home. Now that we have outlined some of the benefits, all that is left is to design your outdoor kitchen around a Southwestern theme! An entire blog could be written about this alone, but rule #1 is to first to play off the desert landscape and use ideas and materials that link with your natural surroundings. Imagine a stained redwood pergola with vintage string lights to define your outdoor kitchen area. Quality stonework around a large bar area with custom granite countertops for seating and working areas. Add a colorful tile backsplash for a dramatic Southwest effect. Stainless-steel appliances including sink, refrigerated drawers, and grill and top it off with an alfresco pizza oven for those pizza enthusiasts! There are endless possibilities for an outdoor kitchen design, and staying with the Southwest theme makes it all more fun to get creative! 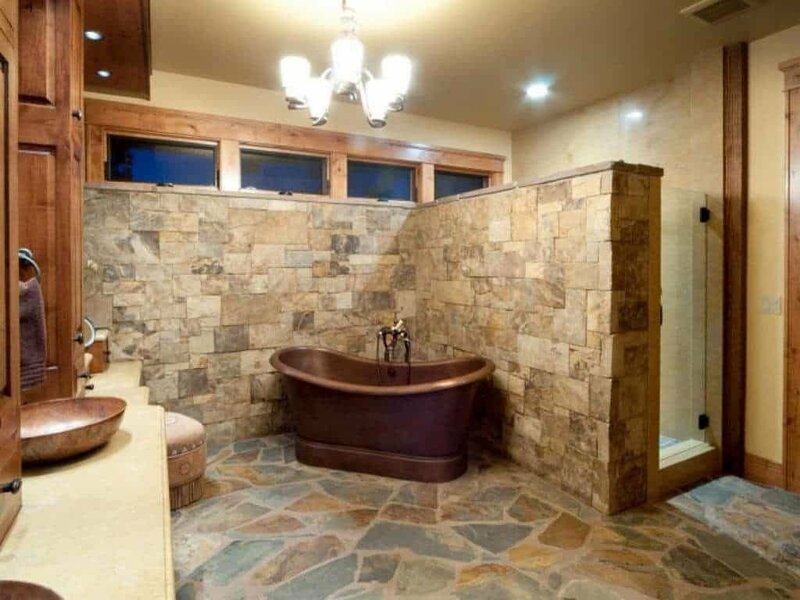 A bathroom remodeling design that reflects the beauty of the Southwest offers many unique and stunning elements to create your luxurious desert sanctuary. Southwestern design reflects a laid back, elegant style that is linked to centuries-old cultures and natural wonders that make the American Southwest so wondrous. When designing a room that emulates Southwestern style, influences should pull from Mexican, Spanish, and Indian roots, with colors that capture the vivid sun-soaked desert surroundings. A Southwestern bathroom provides unique designs and an atmosphere of warmth and tranquility, with color being of high importance. To achieve this bathroom remodeling design, start by discussing your ideas with your bathroom contractor in Las Vegas to explore all options. Flooring will be a significant focal point, so going with a terracotta tile–or for example slate with organic colors–will bring out the uniqueness of the region. Tile for the shower should also reflect the colors found in the desert, as well as tying in colors when choosing vanities and vanity countertops. Paint choice and lighting designs also play a big part in your Southwest scheme. With GI Construction’s team specializing in bathroom remodeling, you are guaranteed to be able to create your dream bathroom! GI Construction will help you design and choose all the components that will contribute to your Southwestern home remodeling transformation. Renovation in Las Vegas is busiest before summer, and the perfect time to begin home renovations to ready your home for an exciting new season of fun under the sun!